We know this in our hearts. Deep down. And, yet, when we see a friend grieving we want to tell them it will be okay. The earth will keep turning. But, for your grieving friend, it will never be "OKAY" again. The deep loss can’t be replaced. In my personal experience, the loss is a child. But, I have many friends who lost their homes and sense of safety and security in the floods during and after Hurricane Harvey. Their “loss” is also one that can’t be replaced. Life is such an emotional rollercoaster. The highs so high and the lows, very deep and low. Several weeks ago, one of my childhood friends (who knows the deep loss of losing a child) texted me that a friend of hers had lost a baby at 39 weeks. The next day, another dear friend of mine was in labor with her seventh baby. I spent the day deeply invested in the outcome of her labor and delivery and in prayer. Her baby was safely delivered in her own hands Tuesday evening. I received two hope boxes when we lost Mary-Linda. What would I do with two hope boxes? I soon knew that my extra Hope box was meant for this other mommy who I didn’t know, but I now grieve with. I added a couple of CDs of hope and mailed it right away. It makes me so sad when a family loses a child. When a mommy loses her baby. I’m also sad as I experienced the joy of my friend’s birth and later grieved that I’ll never experience that joyous birth with our Mary-Linda. Please don’t tell me that I should be okay because I have four living children. Please don’t tell those who have lost their homes, that it’s just stuff. It isn’t just stuff. I know you love us and you want us to be okay. But, Sometimes we are not okay. 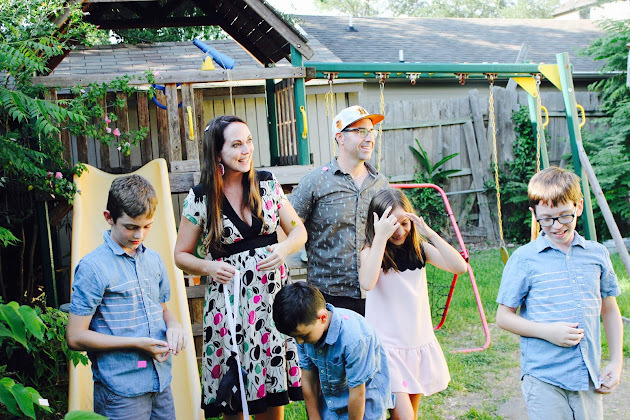 I believe that I am way better than I would be without my four living children, but that doesn’t mean I’m okay with losing a child. 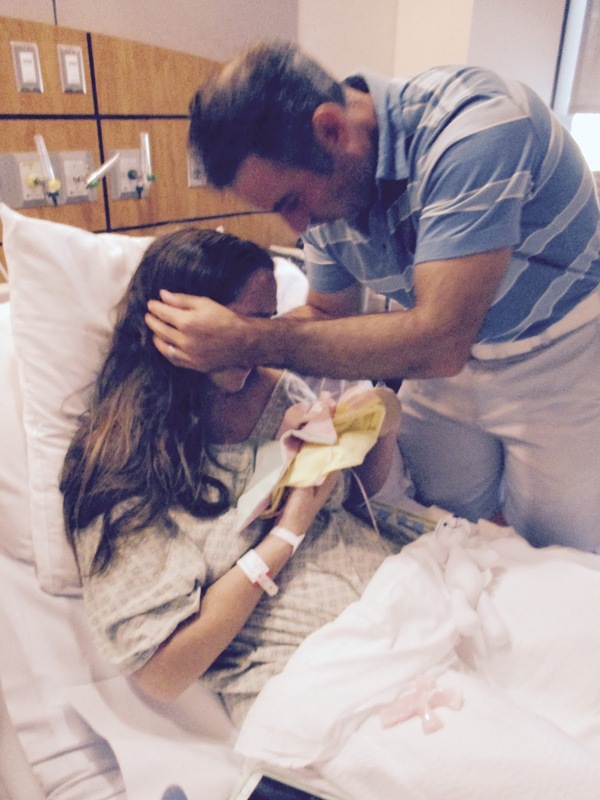 I held my daughter’s lifeless, tiny body in my arms for hours. I couldn’t let her go. She was nine and a half inches long. She was beautiful. She was lean and seemed strong. She was born with her legs crossed and her eyes closed and her head turned to one side. She looked at peace. But, she's not alive on earth. She's gone. And, I'm devastated. I don't know how I will grieve through the holidays. Or through Mary-Linda's expected due date. All I know is that whatever I feel is what I feel. Your grieving family member might not be able to do things they “normally” do at the holidays. (Baking, cooking, gathering around the kitchen just to visit, etc.) Showing up might be all they can do and that’s okay. 2. Be willing to change or alter traditions. 3. Try to listen without offering a solution. It’s hard to see our loved ones sad. But, sometimes it can’t be helped and it is part of the grieving process. It’s better to just be there and say “I love you” and “I hurt for you” than to say the wrong thing. I wrote and recorded this little tune of Thanksgiving, based on Psalm 118, a few years ago. Still giving thanks! It has been three months since we learned that our daughter's heart had stopped beating at over 17 weeks gestation. I would have been a little over a month away from being full-term pregnant now, had she continued to thrive in my womb. I am so sad. My heart aches from deep within. I was in labor all night. Tuesday had turned to the early hours of Wednesday morning. My fever increasing. And, all hope waining. When we learned that Mary-Linda no longer had a heartbeat, we had to make some very scary decisions. Because I was in my second trimester, we could attempt to deliver her. I would be induced. Given cytotec for four doses, followed by pitocen. It wouldn’t be easy, given that my cervix (likely) would not want to open at this point in pregnancy. It could take 3-4 days. The other option was to go in for a D&E. Similar to a D&C but for a pregnancy that is further along. They would remove the pregnancy, but our daughter’s body would not remain in tact and we wouldn’t get to see her. For my heart and the heart and healing of our other children, I wanted the option to hold Mary-Linda, to be available to each of us. Throughout the afternoon and evening, we had many visitors. 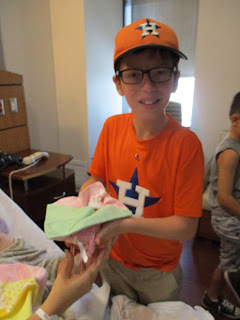 One sweet lady named Heather from “Child Life” visited with us several times. She was so kind to always refer to our baby as our daughter. And, she told us about different services she could offer us. One was a handmade cradle from an organization called Bridget's Cradles. She asked us what color we would like and we chose pink. I didn’t know, at the time, how special this cradle would be for us, for our baby daughter and for our other children. 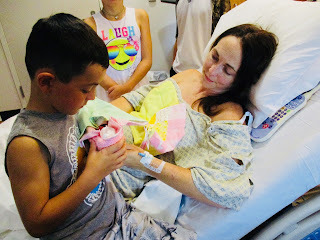 After many scares in the night and early morning, and little change in my cervix, Mary-Linda was born quietly and silently with only her daddy and I in the room. She was still in her sac, with her little feet crossed at the ankle and her knees tucked in close to her torso. Her head was turned slightly to one side, her eyes fused shut and her hands were tucked up under her chin. She looked peaceful. And for four and a half months along, she was beautiful. And small. And delicate. The nurse returned and placed Mary-Linda on my chest. She was 9 and a half inches long. 10 perfect toes and 10 perfect fingers. So tiny and yet so big. She even had finger prints. 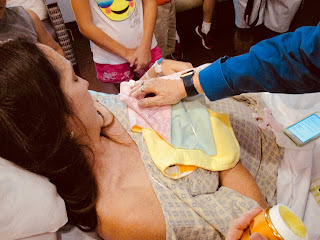 Heather, from Child Life, came quickly and dressed Mary-Linda in a cap, pinned a tiny diaper on her and she wrapped her in a blanket and placed her in my arms. Our older children arrived later in the day. We had moved to a different room and we planned to do a naming ceremony with the Chaplain of the hospital. I held our sweet baby daughter all day. When the Els arrived, Heather had already created a book with photos of Mary-Linda. We decided to show the children pictures of their sister (if they wanted to see them) and to give them the option to see her in person and hold her. They were scared, but having the book of photos to look at first, was less intimidating than seeing her. One by one, they wanted to see her. And, one by one they all wanted to hold her. We had promised each of them that they would get to hold her when she was born. We didn't imagine it would be like this, but it was a beautiful moment filled with so much heartache and love. 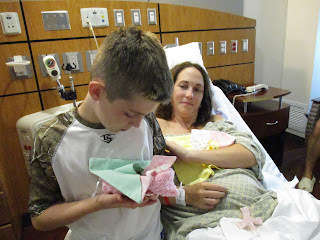 I gently placed her body in the hand-knit, beautiful, pink cradle. (given to the hospital by Bridget's Cradles) The cradle held her little body perfectly. Her body felt so fragile. And, Mary-Linda's big brothers and sister all held her. We all cried. It was so sad, but so important for each of us. I've been given their permission to share some private family photos of this with you here. No one ever wants to be in this situation. Losing their infant child in their womb. 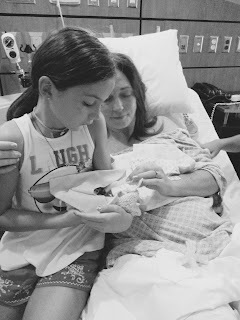 But, having all of us able to hold her was a huge part of the healing process we still find ourselves in. This isn't easy. But, I am so glad we were able to deliver Mary-Linda and were all able to spend time with her body and hold her in our arms. I will be forever grateful to Bridget's Cradles and to Bridget's mother for providing this ministry to families going through this very difficult time. Thank you and blessings to you always.